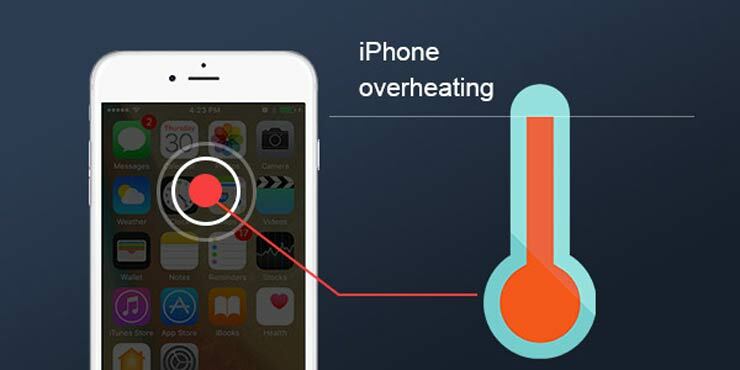 Are you experiencing overheating issue on your iPhone? You're not alone. But do you know why does your iPhone get very hot and how to fix it? Follow this article to find out the causes of iPhone overheating and fix it with easily tips. Have you ever discovered that your iPhone is hot to touch? It's not common. Usually we hold our iPhones in our hands so much that we've been very familiar with the normal or healthy temperature. Even though it varies based on season and climate, we know it immediately once the iPhone is overheating. If it happens occasionally, it's not a huge problem. But it's pretty annoying to have an iPhone always running hot because it also coincides with fast battery draining and general performance sluggishness. Thus if your iPhone is hot to touch or you're unlucky enough to get an iPhone temperature warning, you can bring your iPhone back to optimum operating temperature with the following tips. Why Your iPhone Is Overheating? The processor is under a heavy workload. This can be the most common reason an iPhone feels like it's on fire. Some apps or process running on your iPhone is making heavy usage of your iPhone processor, leading to excessive energy usage and heat dissipation. For example, when you're playing a demanding 3D game, streaming high quality video for an extended period, making heavy use of GPS, or using iPhone while charging, your iPhone CPU can be revved up to 100%. The battery is failing. A failing battery will not only cause the battery draining fast problem, iPhone charging not working, but also iPhone overheating and iPhone won't turn on issue. You can run a battery diagnostics to check for signs of iPhone battery failure. If that's the case, just have your iPhone serviced. Your iPhone is placed in a heat environment physically. You know, iPhone is designed to be used between 0°C and 35°C (namely 32°F to 95°F). If your iPhone is used outside of these temperatures, either in very hot or cold temperatures, it can cause problems. If you've left your iPhone in a car on sunny days or kept your iPhone in direct sunlight, it's not surprising that your iPhone gets very hot, leading to the wreck of iPhone battery and other components. Conversely, if you keep your iPhone away from these hot places, the overheating issue will be fixed. iPhone case does well to protect your iPhone and make it unique. However, it obviously prevents heat from escaping when your iPhone is running overheated. So it does help to remove the case, especially when charging. Sometimes iPhone overheating issue may be caused simply by a single app or too many apps opening at the same time. For that, quitting apps can address the problem. Simply double-click on the Home button, or tap the screen and hold to bring up the multitasking switcher, then swipe up on each app to close and quit the apps. If there are some apps that you don't often use, you're suggested to delete them. This is because all the apps keep running in the background which can be the cause of iPhone overheating. GPS is probably the single function on your iPhone that can heat up your device the most. So when you are not using it, turn it off through Settings > Privacy > Location Services. When you put your iPhone in Airplane mode, it will turn off the functions that produce heat the most, namely GPS, Wi-Fi, Bluetooth and Cellular data. You can turn on it in the Control Centre: swipe up from the Home or lock screen and tap the plane icon. Some users has complained that their iPhone screen dimming randomly when the iPhone gets very hot. On the contrary, when you adjust your iPhone screen darker, it also helps to cool down your overheated iPhone. Go Settings > Display & Brightness > slide the Brightness bar to your desired level of illumination. I bet most of you cannot leave with iPhone even for a while. Thus some of you can't afford your iPhone to get away from you even when it's charging. But using the device while charging is like adding some fuel to the flames. To avoid your iPhone getting overheated, stop using it while you're charging. If your iPhone still overheating, you can try to reset all settings. Just go to Settings > General > Reset > Reset All Settings, then enter your passcode if asked and tap Reset All Setting again to confirm the action. It's worth mention that reset all setting will erase all your default settings on iPhone. This is a simple fix, not only for iPhone gets overheated, but more minor errors on iPhone such as iPhone no sound, slowing down, battery drain fast etc. Hold down the Power on/off button for a few seconds, slide to turn your iPhone off, and turn it back on to reboot your iPhone. If you have tried all the above tips but you iPhone still overheated, you can finally try DFU restore your iPhone. But firstly you need to put your device into DFU mode, then plug your iPhone into your computer and open iTunes to restore in DFU mode. Select your iPhone in iTunes > select Summary tab, and click the Restore button. After the restore, your iPhone restarts, you should slide to set up. Obviously, this caters to the situation that you've put your iPhone in somewhere with high temperature, such as in a locked car. You can fix this issue in a super easy way, just removing your iPhone from the heat source. But please note that don't put your iPhone to a fridge to cool it down, since it will damage the battery and other components when cooling down so fast. Finally, if you have try all means but iPhone overheating persists, you have to consider whether it's a problem of the battery. You can run a battery diagnostics to check if it's the matter. If is, you may need to have a battery replacement or go to repair it. Back up your iPhone to prevent loss of data before fixing iPhone overheating issue. 2 iPhone iPad Stuck in A Boot Loop? Fix It Now!